The cornea is the front clear window of the eye. It has a smooth surface with excellent optics to allow us to see the world in clear focus. Keratoconus is a genetic disease that causes the front surface of the cornea to have an irregular shape. This irregularity prevents clear focus, even with eyeglasses. Keratoconus is relatively common and typically begins in the early teens, advancing into the 30’s. It tends to slow down or be stable after that. One eye is typically affected more than the other. 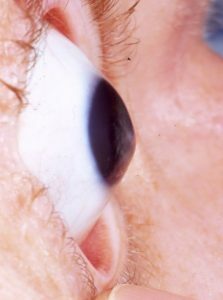 There is some evidence that excessive eye rubbing in genetically pre-disposed individuals can make keratoconus occur earlier, advance faster, and advance further. There appears to be a link to common allergies and maybe to an anxious personality. Soft contact lenses conform to the irregular shape of the cornea, so they don’t correct the blurred image very well. Hard contact lenses convert the irregular surface into a clear image. Collagen cross-linking uses riboflavin and UV light to stiffen the cornea and correct about a third to half of the irregularity. For advanced cases with severe scarring or intolerance to contact lenses, a complete corneal transplant followed by a scleral contact lens, will restore vision. Regardless of the stage of your keratoconus, we can help maintain or restore visual function so that you can participate fully in life. Call us at 480-812-2211 to make an appointment for us to help you.